Day trading is not easy, but the main principles are straightforward. The goal of day trading is to generate profits from the price action of the underlying financial instrument in the shortest period of time. This is often accomplished with the use of margin. The use of leverage can magnify the gains from relatively small price movements. However, leverage cuts both ways as losses can also magnify just as quickly. The first goal of day trading is capital preservation and strategy development and execution consistency. It is in the best interest that Day traders adhere to the risk and probability precept. Risk is composed of a combination of exposure in the form of position size (larger size should be paired with shorter holding periods) and position holding time (longer holding should be used with less shares). Probability is composed of combination of the trade set-up (high-probability) and the range of nominal price targets (smaller price targets have a higher probability to achieve). For example, if a stock is trading at $25.12, it inherently has a higher probability of achieving a price target of $25.38 than $26. When price targets are smaller $0.16 compared to $0.78 in the prior example, the probability rises assuming the pattern is a high probability set-up. The risk can be levered with larger shares, which are offset by the smaller holding period or smaller shares for the larger target. For example, buying 1,000 shares for the $25.38 target, or buying 200 shares for the $26 target. When these precepts are managed and executed efficiently, the trader is able to maximize profits in the shortest period of time to enter and exit a trade with profits. To efficiently execute this precept on a consistent basis is the underlying goal of day trading. The focus on the process ensures the by-product of profits may be achieved. 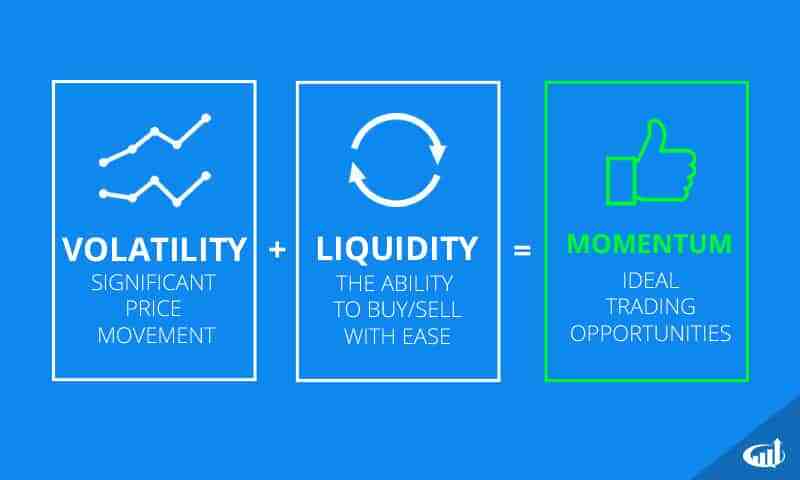 Momentum, liquidity and volatility are the key ingredients for a prosperous day trading market. The chaotic price discovery process that accompanies the market opening consistently provides the most robust action for day trading. Day trading is meant to be more risk-averse as profits or stops are taken quickly, however, the success relies on the individual day trader to have the discipline to execute prudently when opportunities form. Volatility and liquidity provide momentum traders with ideal setups.